We experienced a wonderful time here at NC away from the busy life back in Chicago. We are definitely coming back here. This place was clean and the views were spectacular. Thank you for everything. My mom and I came here for a girls weekend. The hot tub was very relaxing. The bathroom was gorgeous. The weather was rainy so that was disappointing. But we did have a very relaxing time and look forward to coming back to visit again. This was the perfect house on the mountain for our family group. We were for the annual Gerdman's Family Reunion (70 Members from 5 states). The kitchen and the grill were helpful in providing food for the evening meal. The, porch, balcony all provided plenty of room for everyone to eat and enjoy the gorgeous view. We had bonfires in the evening for S'mores, inviting the neighbors of course. We can't wait to come back. We were here last October and found more things to do. A Local told us of a hidden trail to a waterfall and it was spectacular! A Big thank you to the people that keep this house in wonderful condition! White Water Rafting was a blast! There is so much to do in the area and surrounding areas. It is amazing. We may just make this house an every year tradition! Two Families from Tampa and Columbia meet here for a fabulous 4 days of rest and relaxation. The house is warm and welcoming, providing the perfect backdrop for our big group to make lots of new memories in the Smoky Mountains. Thank you for opining the house to us "out-of-towners". We had a fabulous visit. Many lovely mornings drinking tea and rocking on the porch. The view was amazing and the cabin is full of light, well equipped and comfortable What a great place to relax after a day of hiking or white water rafting. Just Perfect. Thank you for a wonderful, re-charge of a visit! We had a great time enjoying the view, the quiet, and our family reunion. This was our 3rd time to Fontana but our first time at this cabin. From the late night talks on the porch to face planting of the wake bored, this house was the ultimate optimal location for having an amazing time. Thank you for letting us stay here and enjoy many sunsets. We can't wait to come back. The cabin was great. Thank you for opening your home to us. Thank you for sharing your home with us. Our family selected Bryson City and Baines Mountain as our 21st reunion site. We were fortunate enough this year to have approximately 70 family members in attendance. The Millstone Lodge was perfect for our immediate family of 4. We enjoyed the tasteful dcor and modern comforts to allow this to be home for a week. Everyone was very friendly and helpful. We booked our reservation by phone quickly and easily. Directions given to us were complete and we had no trouble finding the cabin even in the dark. The cabin is beautiful and well maintained. Everyone absolutely loved staying there. We had many ages in our party including a senior, teenagers and a 2 year old. Everyone loved this cabin and hopes to return for another visit. This cabin offers beauty, seclusion, nature and everything you need inside to be comfortable. We wanted a comfortable place to stay in the Smoky Mountains. I came across this one on the internet and it was beautiful and reasonably priced. Thanks so much for the use of your lovely cabin. We did so much and enjoyed it so much. The Fellowship that happened here was priceless. No better meeting/relaxing place then in the mountains with a view like from Peace of The Mountain. Thank you for sharing your "Peace" with us. We have really enjoyed our time here at Camp Hooty Hoot. We have had so many adventures: zip lining, rough hikes, deep creek. Thank you so much for everything. This is the best cabin we have seen. Thank you for opening your home to us. Had an amazing time! This Smokey Mountain trip marked our first vacation together. The cabin was a perfect get away spot. Quaint, quiet, and beautiful! Enjoyed the Casino and spending time in Bryson City but nothing compared to the steaks on the grill and relaxing in the hot tub. We are definitely planning on a return trip soon! Thanks! Our stay was simply wonderful. We hiked then spent the evenings in the hot tub. We had an amazing time. Even Road the mechanical Bull in Cherokee. WE enjoyed the cabin and hiking in the Smokies. We saw two bears while hiking. We came here to celebrate our 15th wedding anniversary. We hope to return for many more mountain adventures. I called to book our stay and the woman who answered the phone was friendly and helpful. Exactly what you want in customer service. 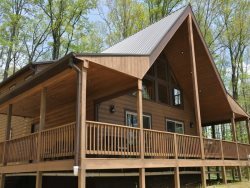 I chose GSCR because the description of this cabin, the fact that it allowed pets, and the price were right for us. My 2 girlfriends and I came to this beautiful place for our annual trip. I think we wore out the rocking chairs on the front porch! we loved watching the sky darken at night and the fog gradually disappear in the morning. We had fun shopping in Bryson City an eating dinner in the cabin, in Cherokee at Brio. We won at the casino. Key at Indian Ink did an awesome on our second set of matching tattoos. We have talked about coming back and bringing our men with us. They would love it as much as us. My 2 Girlfriends and I cam to this beautiful place for our annual trip. I think we wore out the rocking chairs on the front porch! We loved watching the sky darken at night and the fog gradually disappear in the morning. We had fun Shopping in Bryson City and eating dinner in the cabin, in Cherokee at Brio. We won at the casino. Key at Indian Ink did an awesome job on our second set of matching tattoos. We have talked about coming back and bringing our men with us. They would have loved it as much as us. We thoroughly enjoyed Shady Grove. The secluded cabin was very cozy and relaxing. We grilled, white water rafted, fished and got in the hot tub, We will definitely be visiting again. Thank you for a wonderful stay! Everything was so comfortable. It felt like we were at home! Enjoyed our morning coffee with Cutie the dog. (our kids named him that) and the kids had fun hiking the grounds and piking blackberries and making smores every night in the fire pit. We loved Mingo Falls and Clingman's and Smoke Mont for Riding Stables. Thank you and we can't wait to return. We had a wonderful time. My Grand Kids Loved It. We had a wonderful time. A vacation to remember. Thank you for sharing your lovely Native Winds with us.